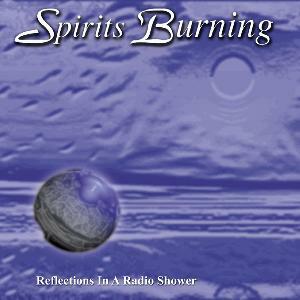 Spirits Burning - "Reflections In A Radio Shower"
Released exactly two years after the first Spirits Burning (New Worlds By Design), the new Reflections In A Radio Shower CD is, like its predecessor, a "gathering in space" organized by Don Falcone, the man behind Spaceship Eyes, Quiet Celebration, and other projects. At a mere glance one might think this is a compilation. But in fact, Spirits Burning is an ambitious project involving creativity by cyberspace and mail. Space rock musicians from around the globe uniting (conspiring?) to bring a unique collaborative effort to thirsty ears everywhere. Feast your ears upon this star studded cosmic cast including members of Mushroom, ST 37, The Moor, Quarkspace, Melodic Energy Commission, Inner City Unit, Mooch, Primordial Undermind, plus Daevid Allen, Carl "Nomuzic" Howard, and others. Among the highlight tracks is "Second Degree Soul Sparks" which has spoken word by Calvert, Daevid, and Thom the World Poet, plus a banquet of space synths that are both ear piercing and heavenly, droning didgeridoo, and trippy rockin' guitar from Daevid Allen and Judge Trev Thoms. A nice cosmic opening track. "New Spell" is a trio of Daevid's gliss guitar, Michael Clare on bass, and Don Falcone giving a dancey drum 'n bass groove to the music. Beautiful cosmic space and tripped out beats. "Clear Audient" has a classic prog rock feel, particularly due to Kenneth Magnusson's mellotron and Trev Thom's delectably tasty guitar licks. Like Steve Hackett playing with King Crimson. "Hidden Rope Trick" has some nice tasty space guitar from Daevid Allen. "Eye = I" is a Mushroom led track. Tribal, bluesy jam rockin'... it's about the rawest and most rollicking music I've heard from the Mushroom clan yet. I really liked Jerry Jeter's vocals on the most recent Spaceship Eyes CD and am glad to hear him singing here on "Intelligent Sparkling Fish" and "Walking Shadow". "Gods At The Top Of The World" and "Elliptical Orbits (Over and Out)" are the two lengthy tracks on the CD. The former starts as a raw space rockin' tune, and then transitions to a jazzy space jamming piece by the members of Mushroom. I like the way Trev Thoms' heavier guitar sound works with Mushroom. Continual AM radio voice samples contrast with the cosmic space, horns, guitars, and synths to make for a freaked out jam. Half of "Elliptical Orbits (Over and Out)" consists of heavy driving spacey prog rock. I really like the combination of Daevid Allen's guitar and Teed Rockwell's Chapman Stick. The other half is a rant from Thom the World Poet, a charismatic and inspiring artist whom I've had the pleasure of hearing several times as M.C. at the Strange Daze festivals and Quarkstock 2000 festival. Good choice for a closing track. Reflections In A Radio Shower is distributed by Gazul Records, a division of Musea. You can visit their web site at: http://www.musearecords.com.